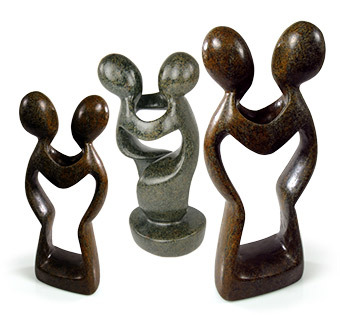 I thought these Shona stone statues were really neat and could possibly be used as a cake topper, sit on the sign-in table, or given as a gift to a couple. They also have different designs, like a dancing couple in the shape of a heart or a family of three (maybe for an expecting couple?). The statues are handmade by a tribe in Zimbabwe and I like how they have a very modern, minimalist look to it. Unfortunately it wouldn't fit in very well with our theme, but maybe a future gift for someone (or when we have a place to decorate). And the best part is that each purchase is for a good cause -- a portion of the price of each item goes toward a free mammogram for someone in need. They also have a one-cent shipping special right now!